We have put together a list of regular activities around Kinsale for you on this page. Click on any item of interest in the Index below and you will be taken to the relevant area on the page. Use the Up-Arrow symbol to return to the Index of Activities below. Pipers Fun Fair. Centrally located in the centre of Kinsale this offers bumper rides, chair-o-planes and all the usual children's events. You are really spoiled for choice if you are prepared to travel a few miles. In the main you are best directed to follow the coast to the West - this will give you the option of uninhabited beaches or the more well known (and populated) alternatives. The choice is yours. Outlined below is a small list that you may start from. Note that SandyCove is in Kinsale itself, Rocky-Bay is to the East near Carrigaline and all the others are to a greater or lesser extent towards the West of Kinsale. The best advice might be to go exploring for yourself - it is certainly worth the little extra trouble. Finally, if the weather is poor, you could try the pool in Acton's Hotel in Kinsale. We can't all be having fun - Regular cleandown and inspection of boat. Please call our office if you are interested in this free, healthy, intensive weight-loss programme!! A great way to get out and about in Kinsale. Go down to the Tackle shop in Pearse Street, Kinsale for all the information on fishing, lures, licences and accommodation. The Bandon river flowing through Kinsale offers fine fishing. More distant are the lakes four your trout and Pike fishing. Get one of the free Maps in the shop of these fishing locations. Tight Lines! Why put yourself through this torture! Bryan and Seano will regale you with the darker side of Kinsale. The side you didn't read about in the brochures - ghosts, ghouls, the Curse of St. Multose, the Battle of Kinsale, the fourth secret of Fatima, body snatchers, and... and... and that's before they start drinking at the Tap. Be warned that much of the really gorier details occurred in the very presence of your intrepid guides. Do the tour before this bloody and gruesome pair are brought to justice. Contact them on their very mobile mobile 086-8555043. Those of your outside Ireland but still on this planet will need to prefix this with +353. Priced £10 adults, £5 for children, the Un-Dead go free! Enjoy! There are three golf links about Kinsale. Kinsale Golf Club, Farrangalway - 18 hole parklands course. Lessons available from Pro - Ger Broderick. Electric buggies and clubs available for hire. Telephone 021-4774722. The Kinsale Historical Society has regular meetings from early Spring to late Autumn. They also behind an information packed booklet, "The Kinsale Record" which comes highly recommended for anyone interested in the history of Kinsale. A new edition is printer once or twice a year. For more information contact the secretary, Mr. Dermot Ryan at 021-4772729, or check any local bookstore. Click Here for a list of past articles. Kinsale is part of the South Union fox-hunt, with hunter trials in the Spring and autumn. Note the annual point to point is held in the first week of July. Ballinadee Pony Trekking and Horse Riding Farm. 6 miles from Kinsale. All equipment and facilities available. Phone021-4771852. Follyfoot Riding Farm, Riverstick. 5 miles from Kinsale. Qualified instructor and group rates. Telephone 021-4771324. Irish was spoken until reletively recently East of Kinsale in the Nohoval region and to westwards on the Seven Heads. Unfortunately you will have to travel further today - Ring to the East and Cape Clear to the West. There are hopeful signs of a resurgence in the growth of Geal Scoileanna (Irish Speaking 2nd level schools) and a marked increase in intrest in Irish music and dance. The recent introduction of the Irish language TV station, TG4, has also improved the situation. Included here are only two links - there are many more easily found. Harbour: Excellent Shelter. Caution in very strong SE winds. Access at all times. Speed Limit in harbour is 6 kts. 35 ton crane, Charts AC 2053, AC 1765, Imray C56, Irish OS 87, Estuary of river Bandon. Pilots available. Cliff/Coastal Rescue. Atlantic 75 inshore lifeboat based in Kinsale with an Arun Lifeboat nearby at Courtmacsherry. Harbour Master: (021-4772503) VHF 16, 14. 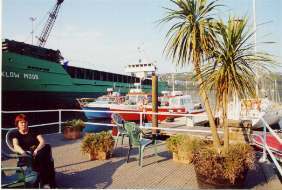 Kinsale Boat Yard: (021-4774774). 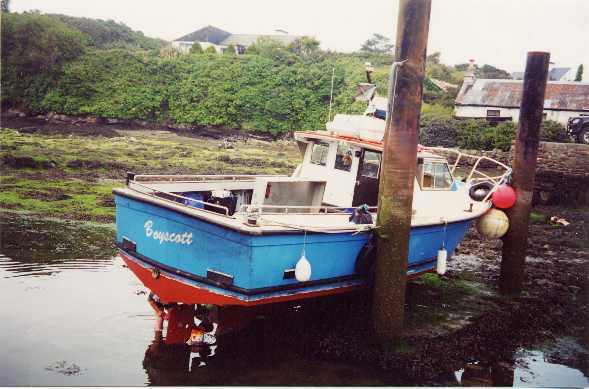 Synchrolift, Diesel, Fresh Water, Electricity, 3 metres, alongside-berth, Moorings available, engine repairs, hull repairs. A really detailed map, with emphasis on historical ruins, castles, cairns etc., the Ordnance Survey Map in the "Discovery Series", number 87 is recommended. Of scale 1:50,000 it is centred on Kinsale and stretches from Cork City in the North East to Kinsale Head in the South and West to Bandon. If your interest is marine, then the following charts are useful: AC_2053, AC_1765, Imray_C56 and again the Irish_OS_87. Macmillan's Nautical Almanac covers Kinsale harbour and approaches very well as do most others of this ilk. The Kinsale Library is also well stocked with detailed and historical maps of the town. Jazz Music by Harry Crosbie and Co. can be enjoyed by all every Sunday from approx. noon until 14:30 at Acton's Hotel. The CORK JAZZ WEEKEND, (usually October), has many events of it's events held in Kinsale - including some very BIG names. See the Events page for more details. Many pubs have music from about from about 8 p.m. 'til late. Check the local journals for more details. St. Multose Church has regular choral and other musical treats. See the Events page for more details. The Library, situated behind the Parochial Hall is small but surprisingly well stocked. Why not grab a book and read it there! Boland's Shop for papers, magazines, journals and a small selection of books. The tourist office for Kinsale material and guides. The Kinsale Bookshop offers a large and varied selection of good books. Quite often there are jumble-sales in the Parochial Hall. Check them out - You never know what you would find. 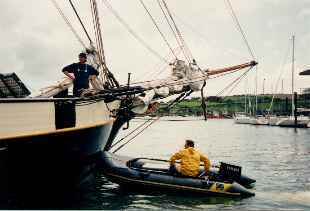 Again, for those of you interested in the History of Kinsale we have included a link to our page of past articles by the Kinsale Record. 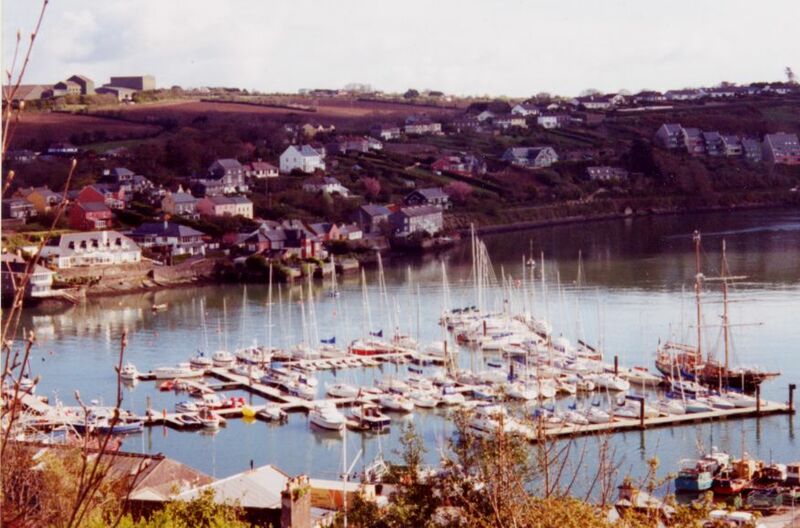 The Kinsale Yacht club hosts a plethora of events over the Sailing season. 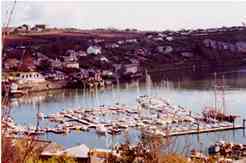 The main racing event of course is the Kinsale Regatta on the August 6-7. The main racing classes and types focused on are cruisers, Dragons, Flying Fifteens, Squibs, 420's and Juniors. Give the KYC a call for more details and order those epaulettes now! 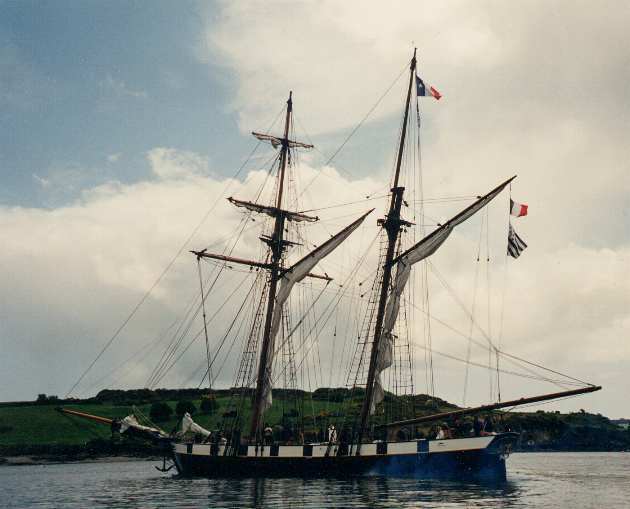 ShearWater Cruises: Offer a skippered 40 ft. ketch for daily and week long cruises . Advance reservation only. Telephone 023-48910. We are available for diving parties as required. Please contact us with your specific requirements. We also have sidescan imaging sonars and a mangentomter. These can be hired with the boat and skipper. You are looking at probably the best bargain around! Go for it! Walking tours of Kinsale depart the Tourist Office daily at 11.15 and 2.15 in the company of Don Herlihy who talks about the history of the town and points out many places of interest. The tour takes one hour and costs £3.50 per person. No reservation is required. The walk is leisurely and suitable for all ages. For reservations Telephone 021-4772873. Walking tours of Charles Fort. The Fort is open for visitors daily from 10.00 to 18.00 - last admission 17.15. Telephone 021-4772263. Oysterhaven Activity Centre: Windsurfers, dinghies and canoes are available for rental on an hourly basis. Sailing/windsurfing courses for adults and children, afternoons, evenings and weekends. The centre is open 10 am to 9 p.m. Monday to Thursday and 10 am to 7 p.m. Friday to Sunday. During July and August five day multi-activity courses are available for 4 year olds to adults including windsurfing, kayaking, adventure trails and team challenges plus sailing in single-handed and crewed dinghies. Telephone 021-4770738. Kinsale Outdoor Education Centre: Based in the town of Kinsale, they offers dinghy sailing, canoeing, board sailing, rock climbing, body boarding, orienteering, team challenges and archery to groups of all sizes from 6 year olds to adults all year round. Expert instruction plus all specialized equipment included in the cost. Telephone 021-4772896. Jet Ski Hire: Located a quarter of a mile past the Trident Hotel at the New Bridge, Kinsale. Telephone 088-2782430. Small Boat Hire: Contact Castlepark Marina Centre, approximately 2 miles from the Centre of Kinsale. Telephone 021-4774959. The area of whale and dolphin research has developed dramatically in recent years with the emergence of the Irish Whale and Dolphin Group, and ongoing work at Irish universities. The Old Head of Kinsale is a particularly good spot for observing cetaceans (porpoises, whales and dolphins). You can expect to sight porpoises, bottle-nose dolphins, Fin whales, Minke whales, Pilot whales or others on any expedition. A typical 150 minute watch produces results 75% of the time according to Padraig Whooley of the IWDG. There is now an annual Whalwatch day in Ireland - typically in August/Spetember - with meetings at the Old Head Lighthouse, Loop Head, The Hook and other promontories about our coast. See our events page for more details. If you are travelling to Ireland on a P&O ferry check out their collaborative whale-watching effort!